Tourism NT aim to grow the visitor economy in the Northern Territory to $2.2 billion by 2020. To help achieve this goal we partnered with our good friends over at Marcel to update the Tourism NT website with a focus on inspiring more people to visit the Northern Territory, stay longer and do more. With three teams, Tourism NT, Marcel and Interesting, working in different locations it was essential that project communications were managed and documented. The teams used Google Hangouts for daily video standups and stakeholder meeting; InVision was used to share and discuss UX and creative assets, and project team managed priorities and deliverables by utilising JIRA to its full capacity - it worked a treat! The new site structure has enabled Tourism NT to consolidate multiple websites down into a single destination site, enhancing the overall site experience. A phased development roadmap for future investment has allowed high priority issues to be identified and delivered successfully; this includes a refined and responsive UX, visual and technical design. Technology and social media are having a significant impact on the way consumers research, share and book travel products. The travel website of tomorrow is made up of helpful utilities that guide and prompt users to take action, engaging content that inspires and visually rich experiences that bring the destination to life. 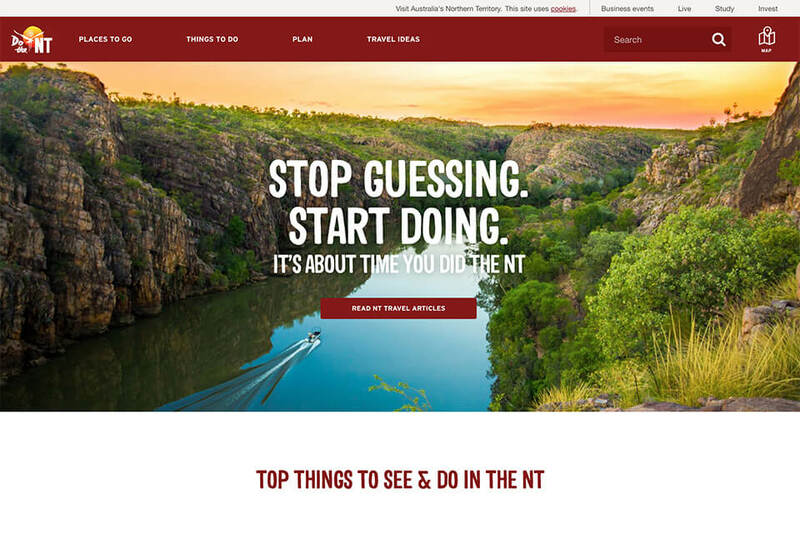 Built around the way consumers make travel purchasing decisions, the new Tourism NT website allows visitors to explore the Northern Territory via editorial content, video diaries or an interactive map. With Each location connected, Tourism NT can build and merchandise pre-planned routes while visitors can easily create bespoke itineraries. The new responsive templates have seen jumps in mobile and tablet traffic and improved Google ranking for content.